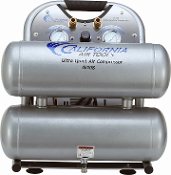 The CALIFORNIA AIR TOOLS 4610S Ultra Quiet & Oil-Free Air Compressor is designed to be one of the quietest air compressors in the industry having only 60 decibels of sound. The powerful 1.0 HP (SP-9413) motor operates at only 1680 RPM creating less noise and less wear. The CAT-4610S Air Compressor has a Oil-Free Dual Piston pump designed to have a life cycle before wear of 3000 Plus hours compared to other comparable air compressors with life cycles of 500 hours or less. The 4.6 Gallon Steel Air Tank is Lightweight (56.2 lbs), durable and very easy to transport. Only 56.2 pounds and easy to transport.